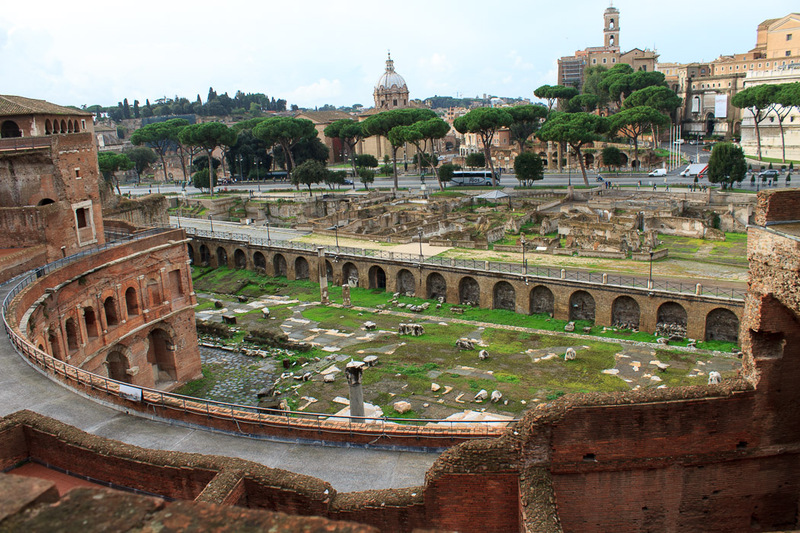 Trajan's Forum was the last of the five Imperial Fora to be built. It is approximately rectangular, running from Trajan's Column to the edge of the Forum of Augustus, and from Trajan's Market to Via dei Fori Imperiali. Part is also under Via dei Fori Imperiali, and Via Alessandrina also runs above it. It can be viewed free of charge at any time from Via dei Fori Imperiali and Via Alessandrina, and is well-lit at night. Some relics from Trajan's Forum are on display in the Museum of Imperial Fora. See all Trajan's Forum photos. The spoils of the Dacian Wars which ended in 106 AD paid for the forum. It required removal of a saddle of land that united the Capitoline Hill (across the street, behind Caesar's Forum) to the Quirinal Hill (behind Trajan's Market and the Forum of Augustus). 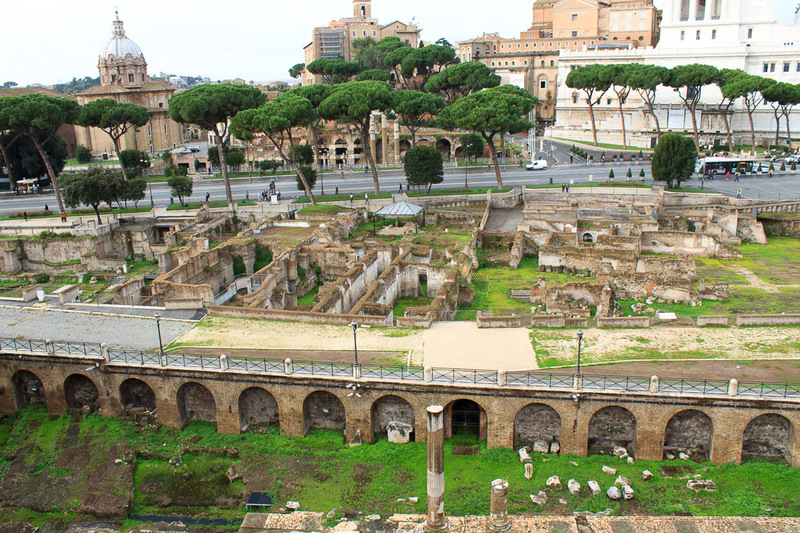 Once the land was removed, the new edge of the Quirinal Hill needed to be shored-up, which was done by the arch-shaped "retaining wall" known as Trajan's Market, located behind the forum. The forum was completed in 112 AD and dedicated by Trajan, whose statue on Via dei Fori Imperiali in front of the Forum is shown in the 2nd photo below. One year later Trajan's Column was dedicated. Unlike the earlier Imperial Fora, this forum was not designed as a single unit surrounding a temple. 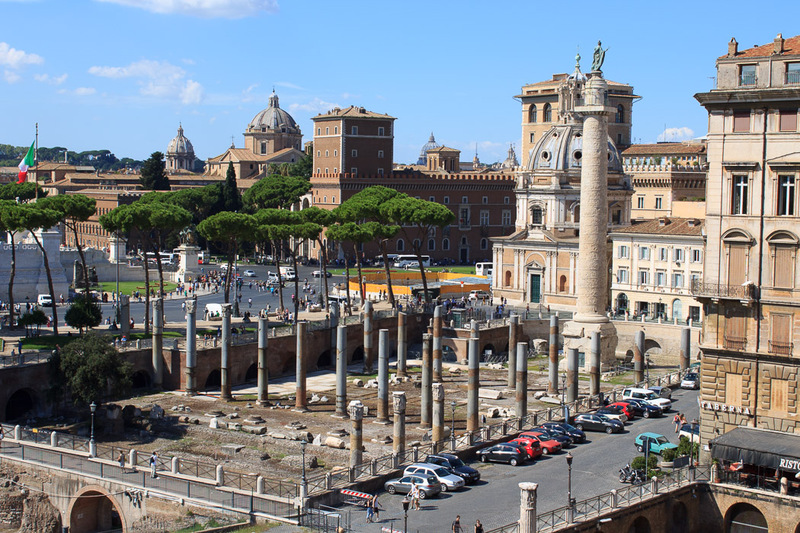 Instead, a large colonnaded square with an exedra on each side led from the Forum of Augustus to the great Basilica Ulpia (1st photo below) that crossed the new forum. This also had an exedra at each end. The Basilica Ulpia (named after Trajan whose full name was Marcus Ulpius Traianus) was a government building. It had no religious function but rather was dedicated to the administration of justice and commerce, like the Basilica Julia and Basilica Aemilia in the Roman Forum. Behind the Basilica Ulpia was a library, neatly divided in two by Trajan's Column, one side for Greek literature and the other for Latin. Behind these, to complete the forum was a great hemicycle where, after the Emperor's death, Hadrian constructed a Temple of Divine Trajan to Trajan's memory. Other monuments added were a triumphal arch entrance at the end close to Augustus' Forum and a great bronze equestrian statue. Though once the most marvellous of all the fori, these days Trajan's Forum is badly preserved and somewhat confusing to make sense of. Trajan's Column, Trajan's Market and even the Basilica Ulpia are easy to see and make sense of, but Trajan's Forum is in rubble, and hard to piece together into anything meaningful. 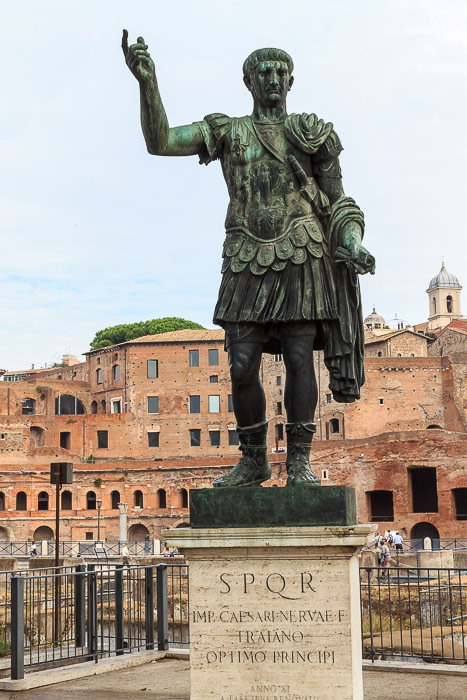 The destruction of Trajan's Forum apparently began before the fall of the Roman Empire, because statues of eight Dacian soldiers were removed from Trajan's Forum for use on the Arch of Constantine.